You can leave our furniture out all year long. 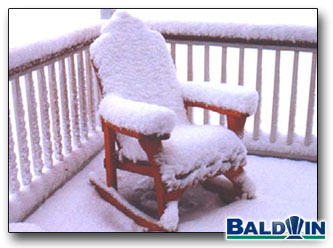 This is a picture of my rocker after a good snowstorm. The whole idea behind buying top quality furniture is that it is made with top quality materials. Materials that can stand up the the elements year after year. Do as much or as little maintinance as you like. Baldwin furniture will be around for a good long time.